Such a happy day with much to be thankful for! I won a generous prize during Stamplorations's Birthday Celebration, and my order came today. According to USPS tracking, my package food a detour of several hundred miles, so my anticipation was building. 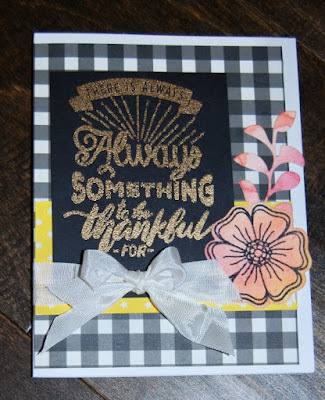 The beautiful sentiment from the Typografia line was heat embossed with gold embossing powder and adorned with a Verve flower cut from a panel I had such fun watercoloring. It fits Tuesday Throwdown's theme of hot colors, I think. 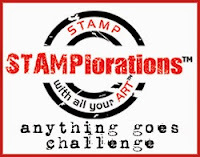 Looking forward to trying more new stamps and using more of the watercolor panels. What a beautiful project. Love the details and digi stamp. 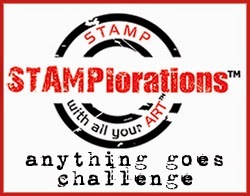 Thanks for your entry in our challenge at Tuesday Throwdown Blog. Happy Crafting!! I love how you used the Typographia sentiment! Well done on winning in the Birthday Celebrations. 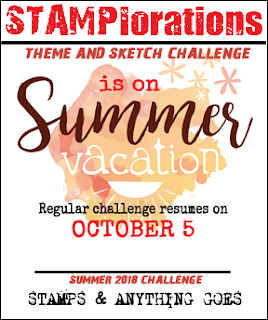 Good luck in our Stamplorations Theme & Sketch summer challenge and thanks for playing with us. Beautiful, elegant card, love the gold embossed sentiment. This is so pretty! Love the embossing! Thanks for joining us at Tuesday Throwdown!